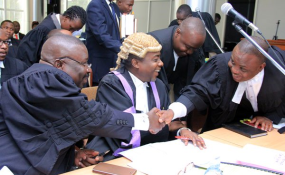 Lord Mayor Erias Lukwago (right) shares a moment with deputy Attorney general, Mr Mwesigwa Rukutana (left) as Mr William Byaruhanga (2nd left), the Attorney General and Counsel Nathan Mpenje (2nd right) look on, during the age limit petition at the Supreme court yesterday. Kampala — The Supreme Court will deliver the judgment on the presidential age limit appeal on Thursday. Sources said the Court of Appeal justices have been working frantically for weeks to see the judgment delivered before Easter. "Take notice that the judgement of this appeal has been fixed for the 18th of April 2019 at 10am... or soon thereafter," reads the court's notice to the parties in the case. The court also warned the parties that if they don't appear, the judgement will be delivered in their absence. The judgment should have been delivered by March 16 under the Judiciary regulations. The Judiciary code of conduct gives any court two months to deliver a judgment that has been put on notice from the date of concluding the hearing. Sources in the Judiciary said the judges met on Friday to see how many had completed their individual judgments. However, only one judge had completed writing the judgment. This prompted the judges to schedule another meeting yesterday to assess the progress and decide whether to maintain the Thursday date or postpone the judgment. The appeal is challenging the removal of the presidential age limit of 75 years from the Constitution, which would bar President Museveni, now aged 74, from seeking re-election in 2021. The sources further said if the other majority judges are ready after yesterday's meeting, then they will ask the registrar of the court to send out judgment notices to concerned parties, inviting them to come and receive their judgment on Thursday. The justices heard the appeal in January and said they would deliver the judgment on notice. The panel comprises Chief Justice Bart Katureebe, justices Stella Arach Amoko, Eldad Mwangusya, Lillian Tibatemwa, Jotham Tumwesigye, Rubby Opio Aweri and Paul Mugamba. The judgment has a big bearing on the 2021 general elections. It will confirm whether, on the account of his advanced age, President Museveni is eligible or ineligible to stand again. Looking back. One of the appellants, Mr Male Mabirizi Kiwanuka, had complained to the Supreme Court why the judges had taken long to deliver the judgment. Last week, the registrar of the court, Mr Emmy Vincent Mugabo, told Daily Monitor that the judgment would be delivered "very soon".